Dr. So Phonnary, President & Group Managing Director ad interim of ACLEDA Bank Plc. 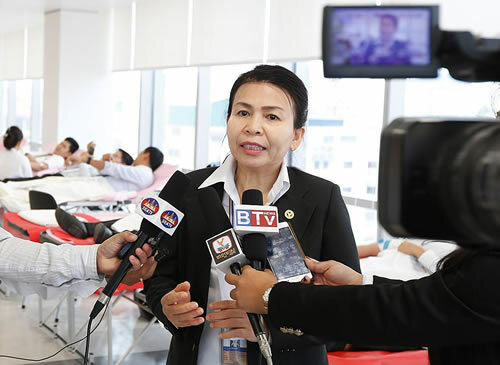 Phnom Penh, January 27, 2016, ACLEDA Bank Plc., the bank you can trust, the bank for the people and the Cambodia's leading commercial bank, announces today that its management and staff at headquarters and branches around Phnom Penh voluntarily participated in donating blood to rescue all the victims and patients who need the blood transfusions. Dr. So Phonnary, President & Group Managing Director ad interim of ACLEDA Bank Plc., said that, "Depending on blood transfusions are needed in hospitals for emergency treatment facilities across the country, ACLEDA Bank Plc. 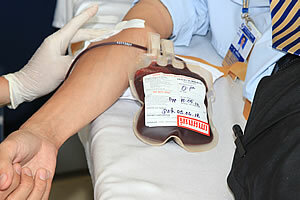 participated in voluntary and charitable blood donation on April 05, 2012. By the way, on January 27, 2016, ACLEDA Bank Plc. also takes its part in a crucial social and the important humanity activities through the donating blood in voluntary to the National Blood Transfusion Center to rescue people's lives in case of emergency." 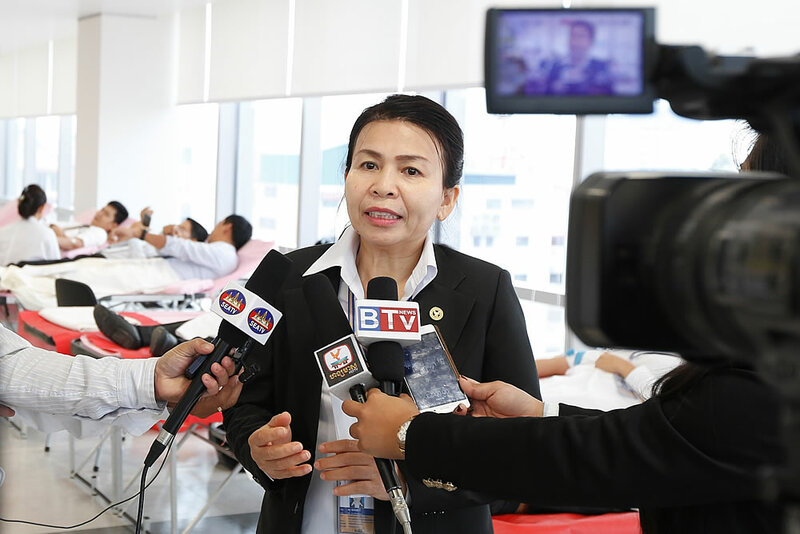 Dr. Hok Kim Cheng, Director of the National Blood Transfusions Center, said that, "Today we do not have enough blood to save lives of people who need blood in urgent yet. Just a day in the capital, the needed blood is between 80 and 100 units for rescue other victims and across the country is about 150 units everyday, so we need more blood to save lives immediately. 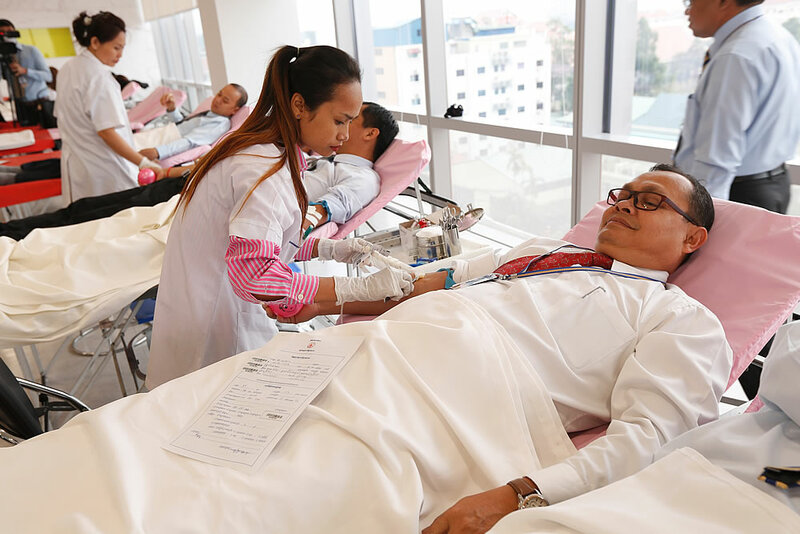 He urged and called on to Cambodian people across the country, especially the youth mercy joins blood donation arrived at his unit to take and to help the victims who need blood is essential and these activities really contribute very much for helping save the lives of other people." He also added that, "If there is no contribution from the kindness of those, centers cannot sustainable produce the blood by itself, so your participation is very important." He expressed his deep gratitude to the ACLEDA Bank Plc. 's management and staff at all levels who donated blood to the National Blood Transfusion Center to save the victims who need blood as necessary. Currently, ACLEDA Bank Plc. has 05 subsidiaries which are ACLEDA Bank Lao Ltd., ACLEDA Securities Plc., ACLEDA Training Center, ACLEDA MFI Myanmar Co., Ltd. and ACLEDA Properties Ltd. By the end of December, 2015, ACLEDA Bank Plc. has total assets of US$ 3,844 million, loan outstanding US$ 2,454 million, and deposit US$ 2,616 million.